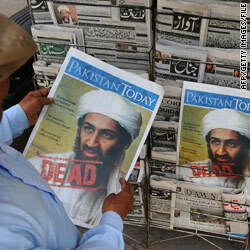 What do we do with the death of Osama bin Laden? He is dead, and if anyone in modern history was desired dead, bin Laden is the man. He, more than any other, is responsible for the loss of life of thousands in the 9/11 terrorist massacre, back in 2001. He, more than any other, was the mouthpiece of one of the most violent expressions of extremism in religion. Many believe him to have been the face of evil. It might be good here to state a few things: I am proud – of our President, of our Country, of our Armed Forces, and of our resolve. We can get embroiled in all kinds of controversy and criticism, but at the end of the day – for me, a Christ-follower – all I have is the scriptures, and they clearly teach that God has ordained those who lead the nation of which I have citizenship. That’s all I need. So, with that said, how did you react when you heard the news? Did you celebrate? Did you grieve? Were you conflicted? And how are we supposed to respond? So is there room to celebrate? I would say yes, absolutely, in fact I personally was thrilled upon discovering of bin Laden’s death. Thrilled because justice was done, and because closure was accomplished for a lot of families. Thrilled because a monster is no longer among us. And thrilled because I was and continue to be overwhelmed with pride in our amazing Armed Forces. But the Gospel compels me to grieve too, as God grieves. The death of the wicked serves as evidence that something is terribly wrong with our world – it is broken and irreparably damaged by sin. Little boys and girls that grow up to be murderers do so because a world that was created to be lovely has been turned into an incubation chamber for evil. Why would God not grieve? Why would we not? So I celebrate… and grieve – But I do so with hope, because my solace is found in the One that took both the reason for and the guilt of a world of sorrow along with the hope of a day when sadness and death would cease, completely upon Himself. I can celebrate Jesus. And that is enough. Thanks for writing about this, Pastor Mike. Many of my friends and family have been discussing this over the past week, expressing viewpoints across the emotional, political, and spiritual spectrums. I totally agree that we should rejoice that justice has been done and that the world is better place with Osama bin Laden dead, while at the same time regretting the fact that he chose such an evil path and that his death was, at this point, a necessary evil. My opinions on this event change though, depending on who I talk to. What frustrates me most about this past week is those who ignore bin Laden’s evil entirely and blame the Navy SEAL team, President Obama, and/or the US in general for being so brutal in “punishing” a “defenseless” middle-aged man. When I see or hear people valuing the life of this terrorist over the lives of the 3000+ innocent victims of 9/11 and their families, it really gets my blood boiling. And yet, God’s love extends to every human being equally; His desire for a restoration with bin Laden was the same as His desire for a relationship with you or me. Balance, especially concerning the death of any human being, is important. This blog post reminds me, and everyone else, that we can celebrate the demise of evil while regretting the existence of that evil in the first place. And that is a good thing. Thanks! Mike, that was excellent writing. I must say I was glad to hear that we finally got Bin Laden and I was not saddened any. I believe in Christ and his teachings but regretfully I being human have many flaws. No one ( on this earth) would ever be able to change Bin Laden and he would have continued to kill innocent people and so many lives would be adversely affected. Wish you would move to Iowa and open a church… We miss you and are fortunate to at least be able to communicate and stay in touch through facebook. My goodness the big “50”I remember when you turned the big “40”. Have a good one and try not to spoil the new family member too much!! good luck with that one. Hello to Katherine for us…25 years, congrats, Randy and I will be 41 this year…Boy is he lucky!! You are currently reading Why We Celebrate & Why We Grieve at unfinished1.